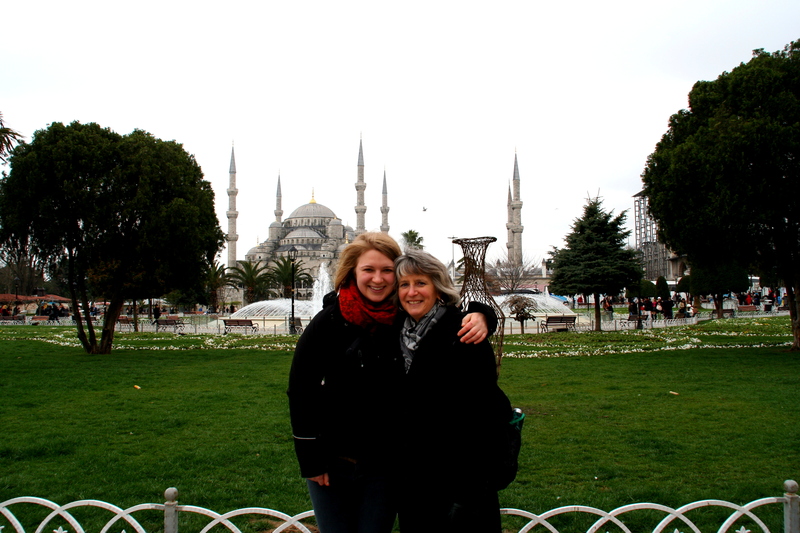 My daughter Bryn and I went to Istanbul for a week over Easter/Passover. We experienced too much to fit in one blog posting, so this is the first of what will be several missives about our trip. Rather than organizing things chronologically, I’ve decided to do so topically and I’m beginning with the buildings that dominate the city’s landscape: mosques. 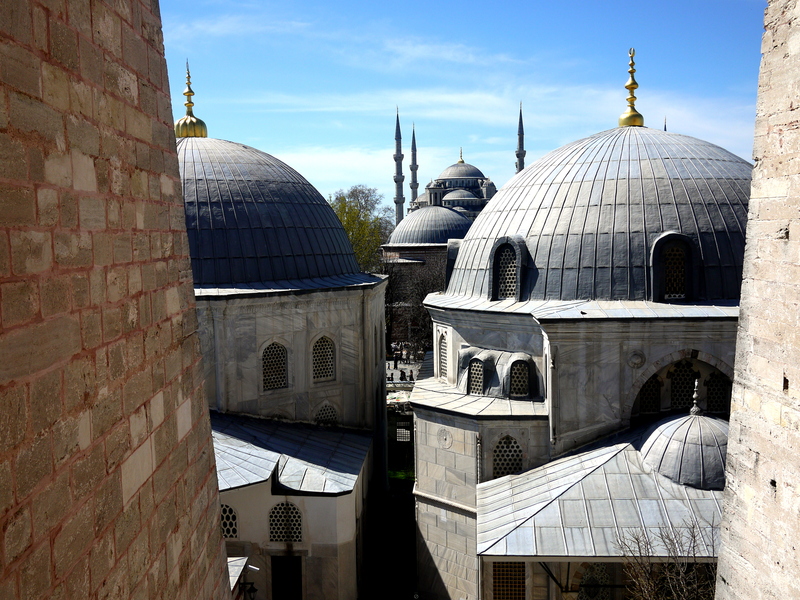 to the imposing Blue Mosque with its six minarets. Even if one were blind and could not see the mosques, one would still feel their presence. The call to prayer sings out from all over the city five times a day. The timing of these calls varies with the season, as they relate to sunrise and sunset: morning, mid-day, afternoon, sunset and evening. While we were in Istanbul, we heard the first call to prayer at about 9 am and the last one at about 8:30 pm. Before modern technology, someone would actually climb up into the minaret(s) and sing/shout out the call to prayer. These days, the callers stay below and their voices are broadcast out of speakers located on the tower(s). Each mosque sends out their call, so one becomes surrounded by the sound. 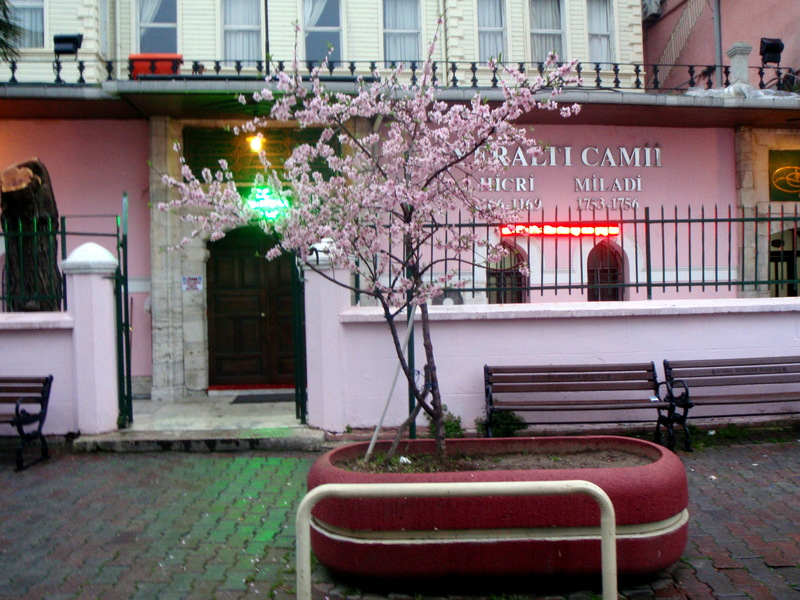 The mosques are generally open to the public, except during the five prayer periods. Women are expected to cover their heads, so Bryn and I always had scarves packed along for that purpose. The interior floors are carpeted and one removes one’s shoes prior to entry. 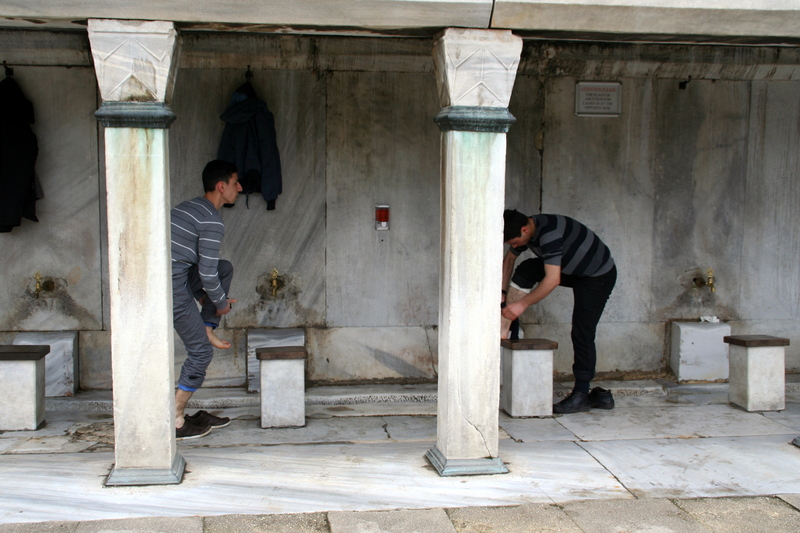 Believers typically wash their feet, arms and forehead prior to entry, as these body parts will touch the floor during their prayers. 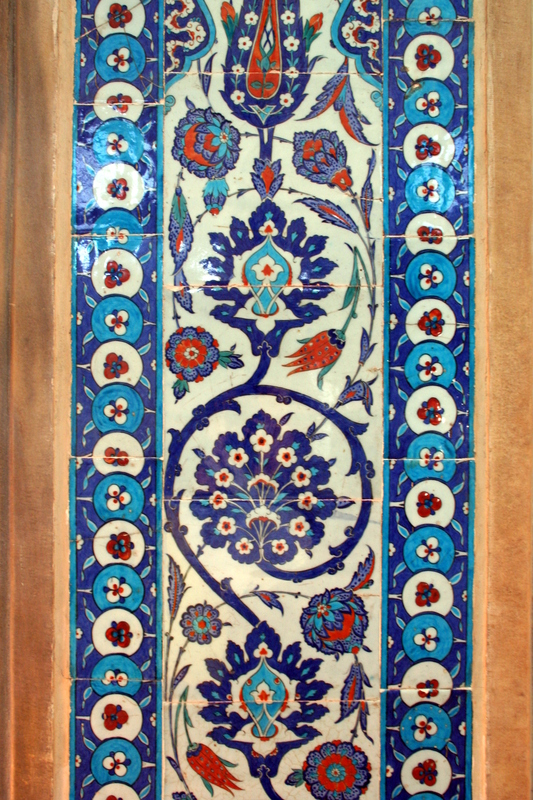 The Blue Mosque is so called, by the way, not because of anything blue on the exterior, but rather because of the beautiful blue İznik tiles in the interior. 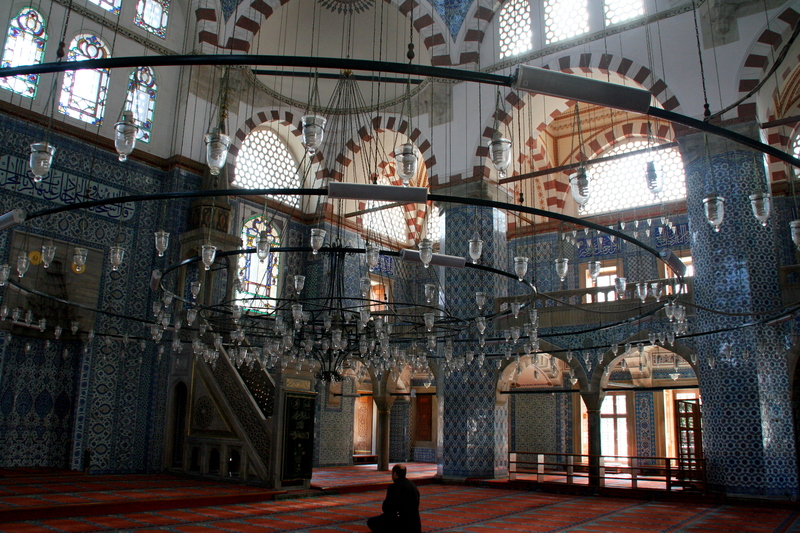 We were also impressed by the tiles inside the Rüstem Paşa Mosque, built in 1561 by the great architect Sinan. 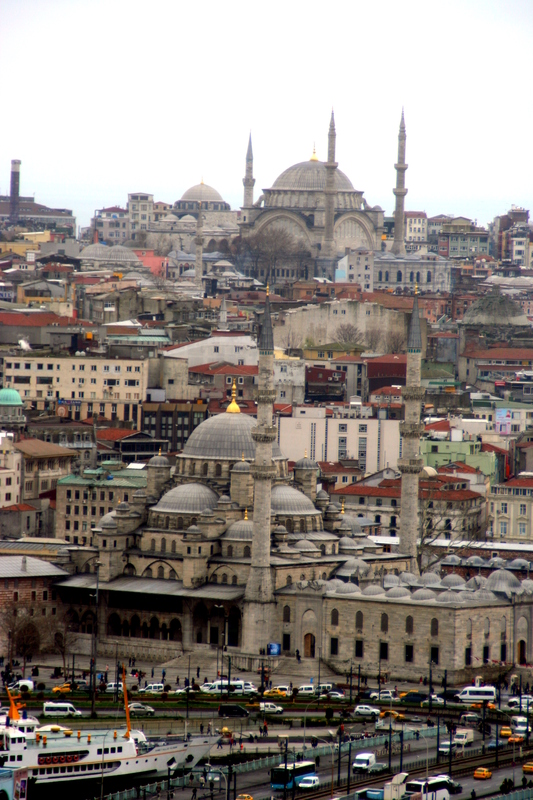 Many of Istanbul’s mosques were originally churches which were re-purposed by the Ottomans when they conquered the area. 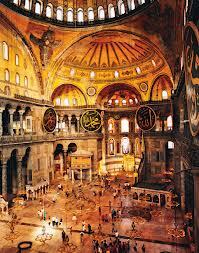 In the Little Haghia Sophia Mosque, one can see Greek script in the interior, a clue to its prior history. 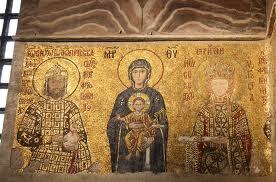 Haghia Sophia was also a church, then a mosque, and now is a museum. 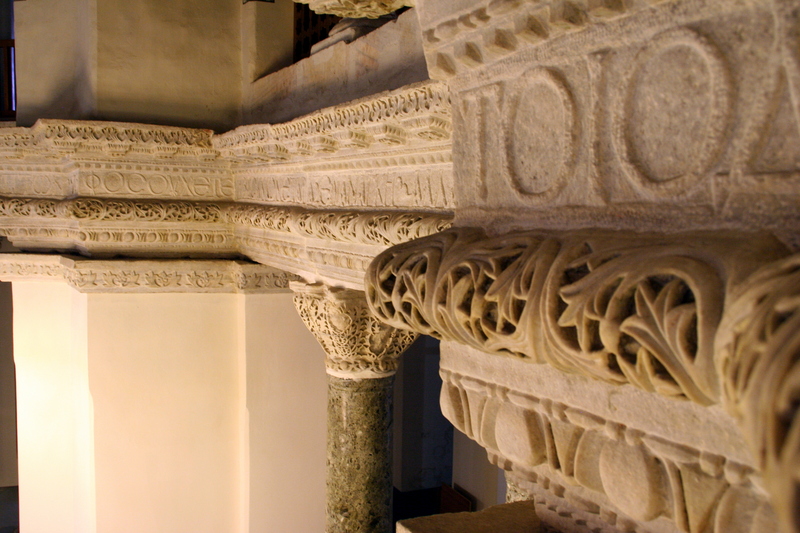 Originally built in the 4th century (no typo, 4th, not 14th), the building is an architectural wonder. Its massive dome seems to float with no visible means of support. 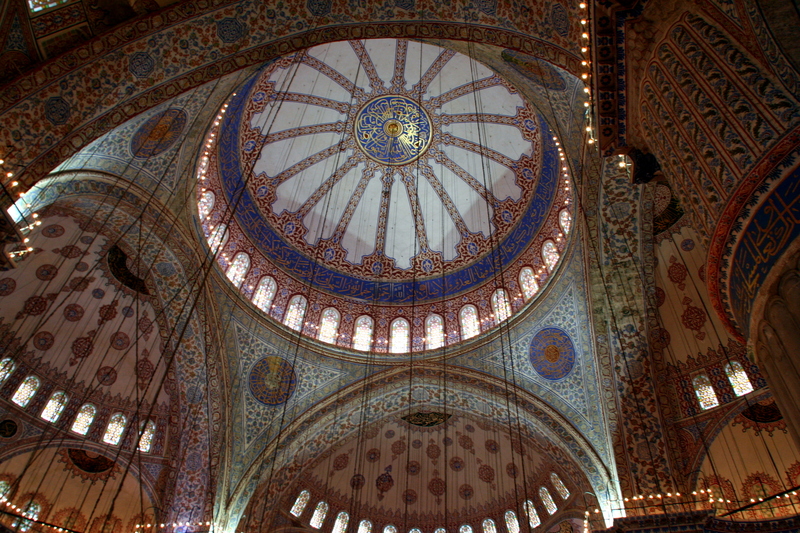 When the Ottoman Turks conquered Constantinople in 1453, Sultan Mehmed II had the bells and altar removed, and the religious mosaics plastered over. When Turkey became a secular state in the 1930’s, Haghia Sophia was converted into a museum and the spectacular mosaics were revealed. 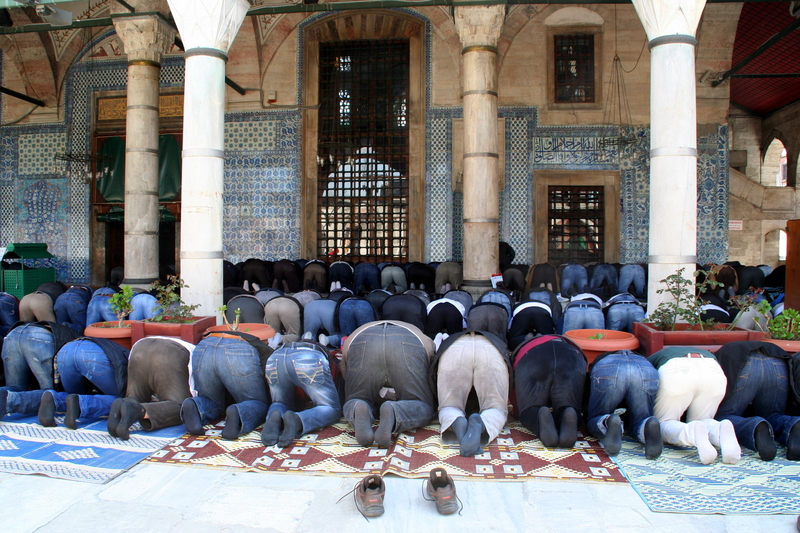 Friday is the main religious day for Muslims, equivalent to Sunday for Christians and Saturday for Jews. On Good Friday, Bryn and I made sure to be at a mosque for the mid-day prayer. It was an overflow crowd, all male. I exaggerate. There were two women who went into the special women’s area of the mosque. 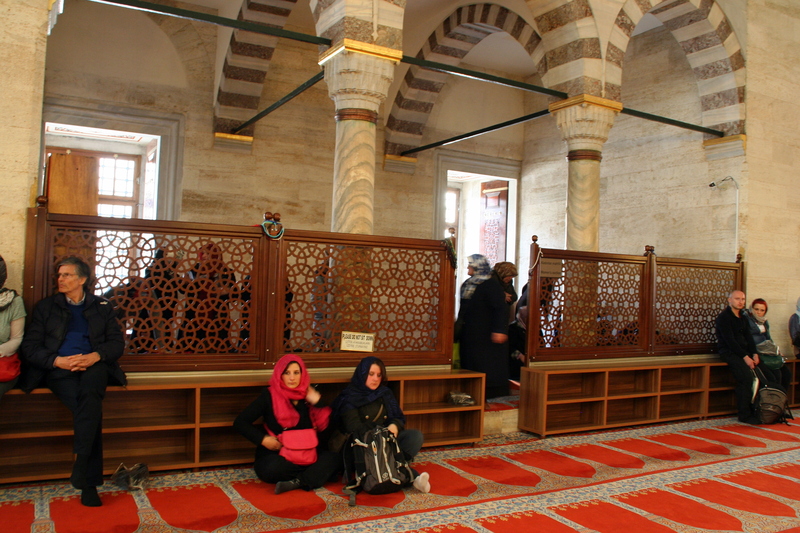 Most mosques have small separate areas for women, screened and partitioned off from the main prayer hall. 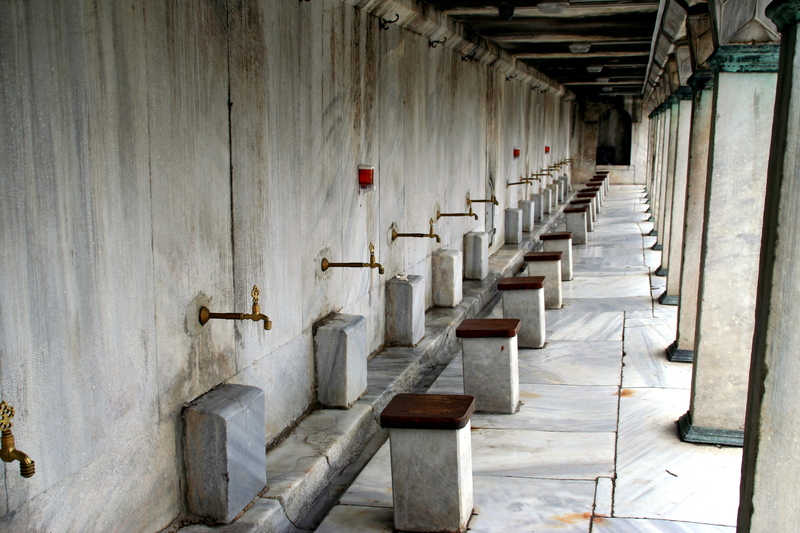 Each mosque has a mihrab, which is a niche that indicates the direction of the holy city of Mecca. Below you can also see a kürsü, which is a special chair for the imam. 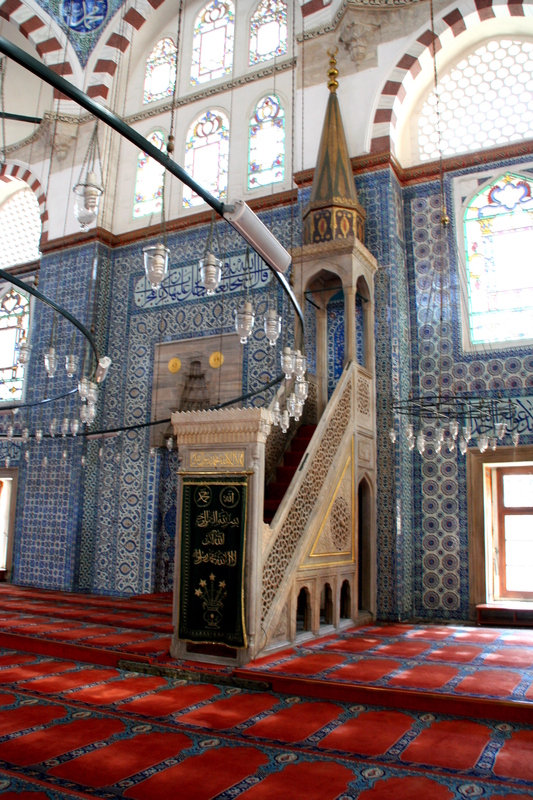 A mosque also typically has a minbar, or pulpit, used for sermons. 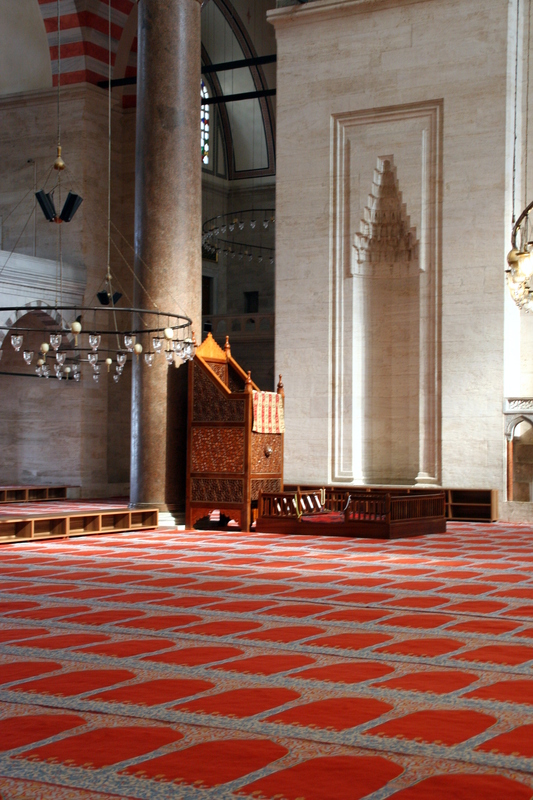 The mosques we visited all felt spacious, even empty. Without pews, the interiors seemed vast. But as evidenced by the Friday service we witnessed, the space is often filled by the faithful. Katy! Again: I’m so impressed about your good eye for making fotos. To watch is like going on an exspidition!